Iraq's Defense Minister Khaled al-Obeidi stands with U.S. Defense Secretary Ash Carter (L) during a welcoming ceremony at the defense ministry in Baghdad July 23, 2015. U.S. Defense Secretary Ash Carter made an unannounced visit Thursday to Iraq, saying he wanted a first-hand look at U.S. and Iraqi efforts to thwart the advances of Islamic State militants. As the insurgents overran Ramadi, the Anbar provincial capital, in May, Carter complained Iraqi troops "showed no will to fight." But at the first stop of a day-long visit, the American defense chief praised Iraqi counterterrorism troops, dressed in their trademark all-black uniforms, as he watched their maneuvers at a firing range. The Pentagon spokesman, Colonel Steve Warren, traveling with Carter, told reporters the Iraqi forces, in combination with U.S. airstrikes, are in the "very early stages" of trying to retake Ramadi, now controlled by 1,000 to 2,000 Islamic State fighters. Warren said Iraqi forces, who are being advised by U.S. troops, are "beginning to isolate Ramadi from multiple avenues of approach" in an attempt to "place a noose around around the city." "What we're doing is isolating Ramadi," Warren said. "Eventually, when the conditions are right, we will transition into an assault, to seize Ramadi." U.S. Defense Secretary Ash Carter, right, and Iraqi Lt. Gen. Abdul Amir al-Lami, center, look over diagrams and maps at the Combined Joint Operations Center in Baghdad, Iraq, July 23, 2015. The United States has nearly 3,400 advisers and trainers in Iraq, but President Barack Obama has balked at calls from some Republican lawmakers to send American ground troops to join Iraqi fighters. U.S. opinion surveys show a majority of Americans are against the reintroduction of U.S. troops in Iraq, which Obama withdrew in late 2011 as the eight-year American war in Iraq ended. Carter was not expected to announce any change in U.S. strategy or troop levels. The Pentagon chief was scheduled to meet top Iraqi officials, including Prime Minister Haider al-Abadi and Defense Minister Khaled al-Obeidi, as well as U.S. commanders. He is to also meet with Sunni leaders that the U.S. is trying to recruit in the battle against the Islamic State, which controls parts of northern and western Iraq. The United States and its allies have launched thousands of airstrikes against Islamic State targets in Iraq and Syria. Despite those efforts, the violence has continued. Meanwhile, the Islamic State group has claimed responsibility for a suicide car bombing Wednesday, at a crowded market in a mainly Shi'ite neighborhood in Baghdad, the Iraqi capital, that killed at least 20 people and injured dozens more. Fighting continued Thursday in Fallujah, a major city on the road between Baghdad and Ramadi. Iraqi political analyst Ali Hussein says there is a weapons factory in Fallujah, and the city is believed to be a recruitment center for Islamic State fighters. Warren says part of the Ramadi operation includes the ongoing battle for Fallujah that began last week. 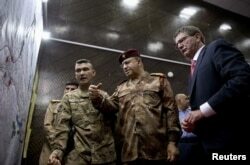 Carter is making his first trip to Iraq as defense chief. He also visited Israel, Jordan and Saudi Arabia this week.